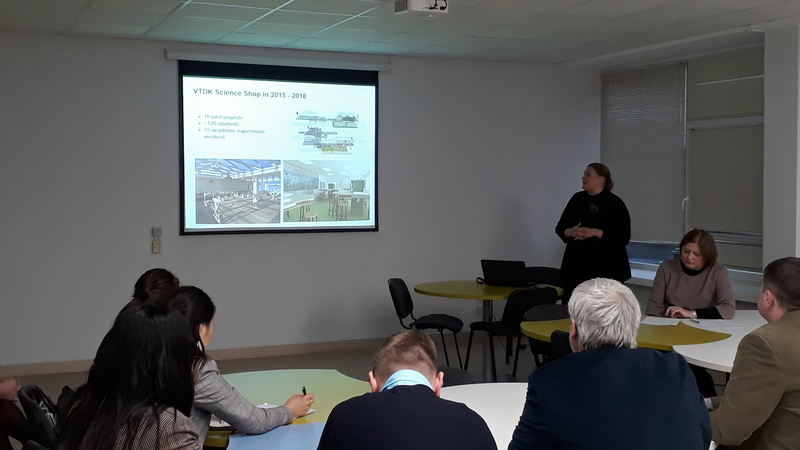 During the International week taking place in Vilnius in November 2018 VTDK Science Shop coordinator took a chance to present ENtRANCE project and VTDK Science Shop experience to the foreign partners, coming from both EU and non-EU countries (such as Armenia, Kazakhstan, Russia, Serbia, Bosnia). Throughout 2015-2018 Vilnius College of Technologies and Design has worked toward establishing a Science Shop, which as a newcomer was part of the EnRRICH project funded by Horizon2020 program. Beside their direct purpose and benefit for local community, pilot VTDK Science Shop projects aimed to answer organizational questions and help to find the most suitable organizational solution for VTDK Science Shop. Summary of progress so far was presented to international VTDK partners, who found the idea of the Science Shop rather interesting, as institutional initiatives of carrying out research on behalf of local communities or Civil society organizations are not so common yet.